Successfully Added MGCOOL Explorer 4K Action Camera - 170 Degree Lens, 2 Inch Screen, WiFi, 64GB SD Card Slot, App Support, 1050mAh, IP68 Case to your Shopping Cart. 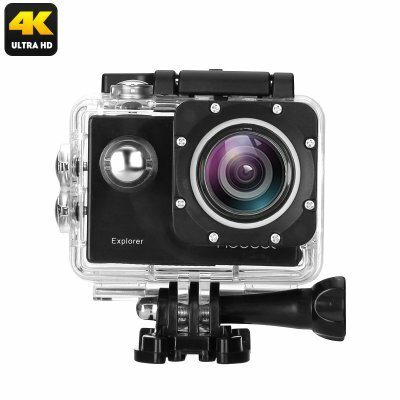 The MGCOOL Explorer Action Camera is a compact yet powerful 4K sports camera that allows you to shoot absolutely stunning images and footage of all your upcoming holidays, road trips, and outdoor adventures. Whether you simply use it as a compact camera to snap breathtaking 16MP photographs, or as a sports cam to shoot ultra-HD 4K video (3264 x 2448) – this action camera is sure to meet all your demands. Featuring a 1/3.2-Inch CMOS sensor, this action camera is capable of producing detailed and sharp images that truly bring forth the intensity of your favorite extreme sports. Its 170-degree wide-angle lens additionally provides you with a broad recording angle that captures all that’s happening around you – guaranteeing that not a single detail stays uncaptured. Coming with a 2-Inch LCD display at the back, this 4K sports camera allows you to instantly watch back previous recordings and pictures on the spot. Thanks to its WiFi connectivity, this interpolated 4K action camera allows you to send all your recordings to your mobile phone from where you’ll be able to share them with friends and family online. Like this, your loved ones always stay up to date about your latest adventures and outdoor activities. The sports camera furthermore comes with a 64GB TF card slot – letting you save images and footage without needing to worry about storage space. The MGCOOL Explorer Action Camera comes with an abundance of clips, bases, and stands that allow you to efficiently attach it to your helmet or bicycle. The package furthermore includes an IP68 waterproof case that can resist water up to 30 meters in depth. Thanks to this, you’ll be able to use this magnificent 4K camera in the worst weather conditions as well as underwater while swimming or diving. With its 1050mAh battery, it provides up to 80 minute of usage time – enough to capture the highlights of any day filled with sports and adventure. This 4K Camera comes with a 12 months warranty, brought to you by the leader in electronic devices as well as wholesale electronic gadgets..